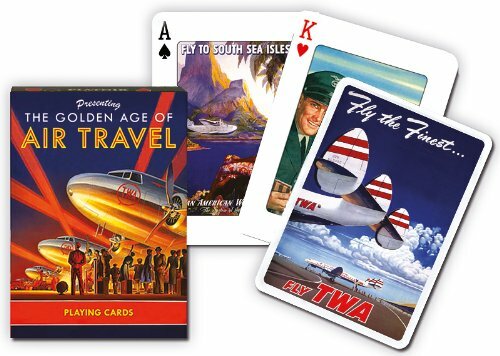 Golden Age of Air Travel Playing Cards. Single deck set. Made in Vienna Austria by Piatnik. Made from High Quality Paper. Packaged in sealed illustrated deck box. There was a time, long ago when air travel was exclusive and glamorous, when the novely of speed, and seeing the world from the sky was thrilling. These collectors' playing cards celebrate – in vintage posters, ads and rare photos – a golden age where passengers sat in streamlined ease, cosseted not corralled. Manufacturer: Piatnik of America, Inc. Publisher: Piatnik of America, Inc. Studio: Piatnik of America, Inc. If you have any questions about this product by Piatnik, contact us by completing and submitting the form below. If you are looking for a specif part number, please include it with your message.